Cambridge, Mass. – Aug. 6, 2015 – Five distinguished computer scientists will join the faculty of the Harvard Paulson School of Engineering and Applied Sciences (SEAS) this fall. Former Microsoft CEO Steve Ballmer ’77 announced last year a plan to increase by 50 percent the size of Harvard’s computer science faculty. The influx of talent is a direct result of his support. SEAS does not have departments. Instead, interdisciplinary teaching areas and research interests guide the faculty and students and encourage collaboration. Harvard has been home to major breakthroughs in computer science, from the invention of the first large-scale automatic digital computer to fundamental advances in cryptography and coding, learning theory, data management systems, algorithmic economics, privacy and security, collaborative planning, and the first self-organizing thousand-robot swarm. 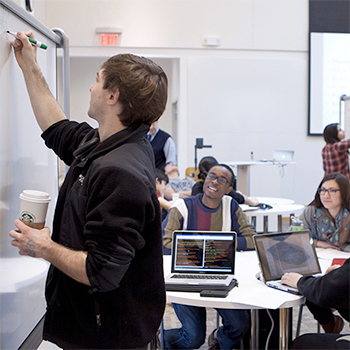 Harvard computer science students have founded successful companies including Microsoft, Facebook, Electronic Arts, Airbnb, and Zappos.com, among others. SEAS is the newest of the University’s 12 Schools, having transitioned in 2007 from a division to a separate school within Harvard. It was renamed the Harvard Paulson School in June 2015, in recognition of a $400 million endowment gift, the largest in Harvard’s history, from John A. Paulson, M.B.A. ’80. In the coming years, computer science and other parts of SEAS will expand into new state-of-the-art facilities on Harvard’s campus in Allston. The number of undergraduate computer science concentrators has increased by a factor of four since 2007, and the percentage of women students has also grown. Meanwhile, more Harvard students pursuing other disciplines are enrolling in CS courses. Last year, CS50, the introduction to computer programming course, became the most popular class at Harvard with enrollment surpassing 800 students. This year, CS50 is being offered on the Yale campus. Applications to the master’s in computational science and engineering at SEAS have more than doubled since the program was launched in 2013. The computer science professors are among nine new faculty who are starting at SEAS this fall. Other new recruits will bring expertise in electrical engineering, bioengineering, applied mathematics, chemical engineering, and materials science. Boaz Barak, Gordon McKay Professor of Computer Science, joins Harvard from Microsoft Research New England where he was Principal Researcher. His research interests include all areas of theoretical computer science, particularly cryptography and computational complexity. He previously was a professor at Princeton University. Scott Kuindersma, Assistant Professor of Engineering and Computer Science, a robotics specialist whose interests broadly encompass robotics, optimization, control, nonlinear systems, and machine learning. James Mickens, Associate Professor of Computer Science, works on a variety of topics including data center-scale storage and secure computation. He has worked at Microsoft Research since 2008, focusing on projects that improve the performance and robustness of client-side web applications. Alexander (Sasha) Rush, Assistant Professor of Computer Science, studies and develops systems for natural language processing with the goal of textual understanding. His work utilizes methods from statistical machine learning and combinatorial optimization. Madhu Sudan, Gordon McKay Professor of Computer Science, whose research lies in the fields of computational complexity theory, algorithms and reliable communication. He previously was Principal Researcher at Microsoft Research New England and an Adjunct Professor at MIT. Recruiting Boaz Barak and Madhu Sudan to the faculty builds on a long tradition of excellence in theoretical computer science at Harvard, where they join Turing Award winners Michael O. Rabin and Leslie Valiant. In addition to the new faces, two CS faculty members were recently promoted to tenure: Yiling Chen, Gordon McKay Professor of Computer Science; and Eddie Kohler, Microsoft Professor of Computer Science. Longtime SEAS faculty member Greg Morrisett left Harvard at the end of the 2014-15 academic year to become Dean of the Faculty of Computing and Information Science at Cornell University. For more about computer science at Harvard, click here.